Sarah was probably just as fed up as we were to be seeing her progress affected by the Leeuwin Current. She spent all day being dragged South. Not fun. So she decided to change tactics and pulled up her sea anchor. The instant she did this her course changed and she progressed west and even northwest a bit. Zoom into the tracker and have a look at that. I think she probably started rowing again too as she has achieved a really good night in terms of progress. It is fascinating to notice just how affected she has been by the current. 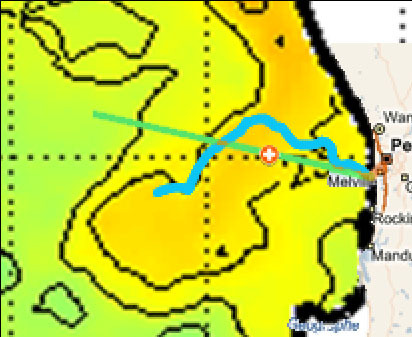 Have a look at the image that shows the Leeuwin Current with her course overlayed on top. She should have a good day today, managing 30 miles or so and making good progress in the right direction. 30 miles is awesome progress. I would be happy with that! Well done, Sarah – you go, girl! Meanwhile, great job Ricardo, for keeping us updated. We are watching Sarah’s track and keeping all appendages crossed for continued good progress. You are doing amazing progress – alone, rough sea around you! Jia You! Jia You! (Chinese, means:Come on! Come on! good going sarah….winnipeg,canada…..thousands of miles from oceans….AMAZING JOURNEY !!! my thoughts and prayers are with you !! Yuor doing great Sarah, and you Ricardo. These updates are great. When sea-sick is gone she’ll be thriving. also thanks to Ricardo for the info that you are giving us along the way, and the encouragement you are giving to sarah,row,row girl. Tova and I are sippin a latte, eating biscuits and thinking of you (what’s changed at Teddies!). We are thinking of you all the time and following your progress. Take care and let’s hope the weather is kinder to you soon. Following your progress from Skowhegan, Maine, USA. Hope all is well out there on the big blue ocean. You have a lot of courage. I wish I had your guts. Good Luck. Be Safe. Well finally underway and doing what seems like forever since starting and planning. I will be watching your progress! Pleased to see you progressing – keep up the hard work and we will see you in a few weeks. You are the bravest girl,we support you,good luck to you! We just thought we would write you a quick message to wish you luck with your inspiring, astounding journey! Also we wanted to say that it was great to have you with us on our gold expeditions, which seem to be fairly ‘microscopic fry’ by comparison with this journey! We just hope it goes really really well, and safely!!! It is, and it will be an amazing achievement/memory!!! We are very impressed by your inspiring example!! !And we hope you smash the records that you are aiming to break, but above all we hope that you have an amazing voyage! GOOD LUCK & GOD’S SPEED! Following you on the Trakker. Trying to organise an interview with the local radio through Amy. Can’t wait to welcome you in Mauritius. Phoenix, Arizona. Keep it up, your dad would have had a hard time, so face your challenges with him in mind. Keep going, and going and going, of course you will do it. You have a cause to champion! Hi Sarah, what a great interview on the radio last night, you really are an inspiration to so many. Looking forward to an Autumn pint with you in the Toby Norris. Loove ans best wishes.